Had a nice time chatting with C over buffet breakfast today at Ramada Central Manila. Lucky me- I got to eat (a lot) their crunchy bacon and french toast. Sorry, no photos of the buffet spread. I had a hard time waking early lately because of the sweltering summer heat. It's like being inside the oven almost every day. C texted me yesterday that she and her dad will be in Manila up to today and is it possible for me to meet up with her today (at breakfast! ), I readily agreed. Not because I wanted to wake up early but because I haven't seen her for a long time. Also, she mentioned that her dad is not a breakfast eater so there's an extra seat for me at the buffet table- yey! Thank you, uncle! 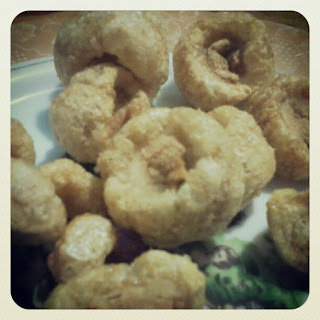 The bacon, as usual, tasted crunchy and yummy. Not the fatty kind that you get from the grocery. However, I can't say the same for the french toast. It tasted somewhat off this morning. Scrimping on ingredients maybe. But I still enjoyed it since C and I were chatting nonstop. Then I had a plate of salad greens, and bowlful of congee with century egg and siomai, a plateful of watermelon and a slice of melon and two glasses of orange juice. No, I'm not on a diet. I am just not hungry yet. Had McDonald's crispy chicken burger for my midnight snack last night- hahaha. Also, C gave me two huge packs of Zubuchon chicharon. Love love love! 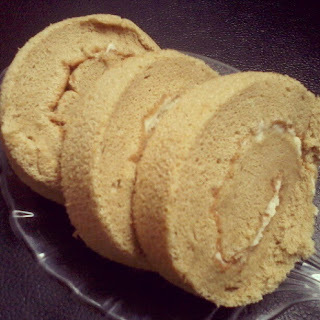 Then I bought mocha roll from Eng Bee Tin as pasalubong for daughter. She just loves this mocha roll. This is my favorite also.